Invited to deliver a lecture in memory of a talented, successful, decidedly feminist judge, Pachauri didn’t think her half of humanity was worth mentioning. 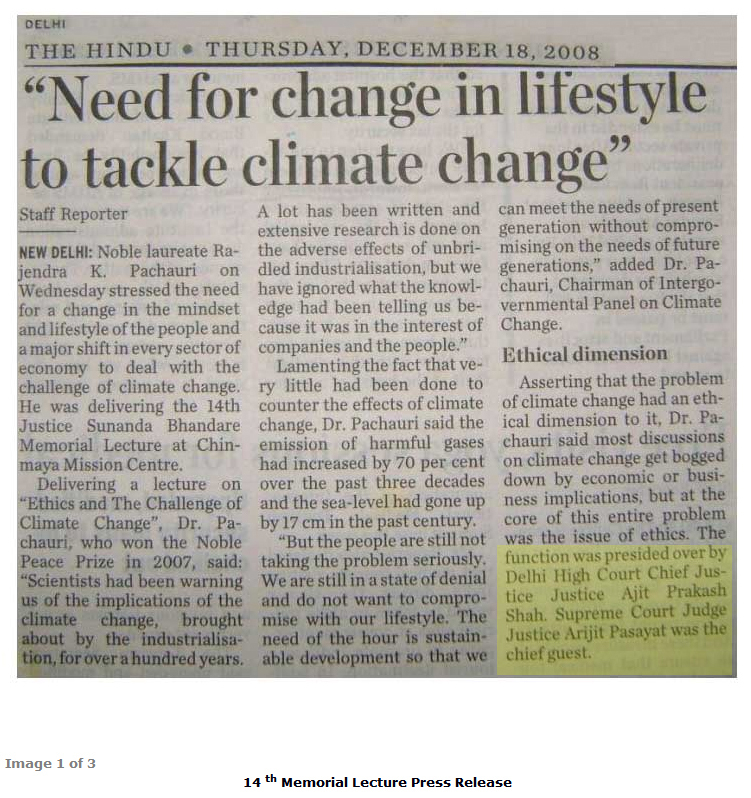 How unfortunate that, in December 2008, Rajendra Pachauri delivered the foundation’s 14th memorial lecture. It has been published in a book titled Struggle for Gender Justice. Pachauri’s lecture was called “Ethics and the Challenge of Climate Change.” If you go to this page on the foundation’s website and click the Read more link toward the bottom left, you can scan all 4,200 words of it. There Pachauri makes a number of statements that bear re-examining given recent allegations that he is a serial sexual harasser of young women (see here and here). Pachauri declares that “the issue of ethics” is “at the core” of the climate change challenge. He maintains that climate change “has been caused by the process of industrialization.” In his view, humanity was “so drunk with this desire to produce and consume more and more” we unethically and deliberately chose to ignore scientific knowledge. This is a good time to remind ourselves that, prior to the industrial revolution, 50 percent of European children didn’t make it past their eighth birthday. One perspective on the last few hundred years is that we humans have worked hard to make the world a safer and healthier place for our offspring. What’s missing from this speech is one word about women or gender equality. The topic simply doesn’t come up. When offered the opportunity to deliver a lecture in memory of a talented, successful, decidedly feminist woman Pachauri didn’t think her half of humanity was worth the slightest mention. Over the years, Pachauri has talked rather a lot about ethics and morality. He has shaken his sanctimonious finger at people who see the world differently than he does, insisting that they’re morally deficient, irresponsible, perhaps even criminal. And yet, a mere six years after he delivered this lecture, it now appears that it is his moral compass that’s broken. The former chairman of the Intergovernmental Panel on Climate Change is a well-connected individual in the jurisdiction in which he is under police investigation. This entry was posted on March 9, 2015 by Donna Laframboise in ethical & philosophical, IPCC, Rajendra Pachauri and tagged Intergovernmental Panel on Climate Change, IPCC, Rajendra Pachauri, sexual harassment, TERI.